Soundproofing is especially important and necessary if you spend a lot of time in your vehicle. It will make your life on the road that much more manageable. 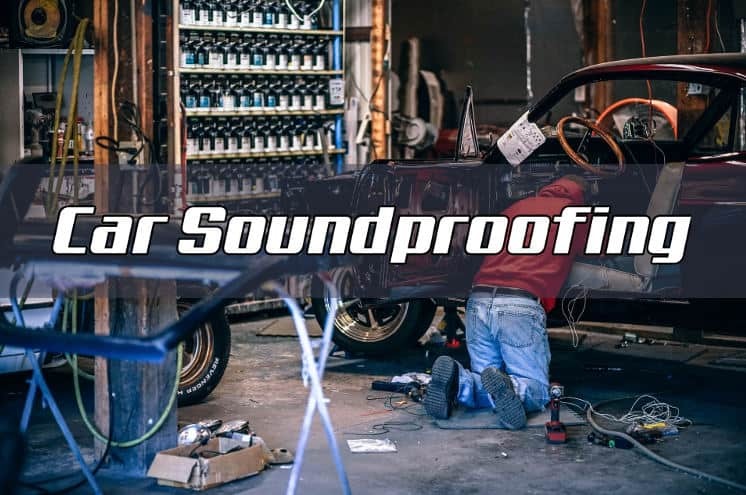 In this article, we dive into the techniques of soundproofing a car. There could be multiple different reasons for cabin noise. To start with, the vehicle itself is one of the noise sources. Although modern engineering is more successful in making engines that emit less noise than they did several decades ago, it still has a long way to go to create a smooth, silent ride. Engineers managed to construct vehicle cabins that muffle the sound of your tires scraping the asphalt and the noises your engine makes. However, they are still at significantly high levels, especially in older cars. There is no such thing as a quiet motor. Your engine makes a lot of noise, even if it’s brand new. That’s why soundproofing is essential. Furthermore, the aerodynamic noise, the noise of the wind resistance, poses a problem both in the interior and the exterior of the car. This type of noise is usually unavoidable, but it can be reduced to a degree by replacing bad seals, or fixing misaligned car doors and windows. An additional noise source is the car’s ventilation system, both the engine cooling system and the internal blowers and fans. While there isn’t much you can do about the internal sources, you can soundproof your cabin so that the external noise doesn’t affect you as much. The external sound is transmitted in the cabin via direct radiation, vibrations from the engine that rattle windows and doors, and through gaps like door seals and rain gutters. Therefore, all those factors should be taken into account when soundproofing your car to reduce in-cabin noise. The first question many people ask is how effective car soundproofing is or how does it work. The simple and short answer is yes, it works. You can get dramatic effects that you’ll notice instantly. If the noise level in your car is getting insufferable, don’t throw thousands of dollars at your problem and buy a new car. Instead, consider making a much smaller investment in the form of soundproofing. It is essentially putting barriers between the noise and the places you don’t want the noise to penetrate. It’s meant to suppress, reflect, or absorb sound waves. Soundproofing materials block the sound by isolating the car cabin to a certain degree. It’s important to note that soundproofing is different than sound absorbing. If you’re just interested in better acoustics in your car, and better sound quality, you can look into sound absorbing materials like the foam deadeners, that can diminish the echo. The level of success of soundproofing depends on the technique you choose to apply. Moreover, the level of noise reduction also depends on the model of your car. Namely, older vehicles will be harder to soundproof to a high degree. However, no matter what kind of car you drive, if you’re expecting total in-cabin silence once you soundproof your vehicle, you’re in for a big disappointment. Nothing can completely cancel out outside noise. Nor should you want that. But, you can get noticeable results. Just a general rule, different soundproofing methods can, on average, reduce the in-cabin noise by around 50%. We already covered sound deadening materials in previous articles. Check out “Reviews of 10 Best Automotive Sound Deadening Materials” for info about effectiveness and pricing. Sound deadening car mats are an efficient and affordable way to not only reduce the noise in the car cabin but also to regulate the temperature. These mats are placed on the cabin floor, usually in both the front and the back, to cut down on the sound and vibrations your car engine and exhaust system makes. They are very easy to install. Just take out your floor mats, apply the sound deadening car mats and you’re done. The sound deadening materials are incredibly useful. They can be applied all over the car cabin, as well as on the roof and in the trunk. Usually, the soundproofing process begins with soundproofing the doors. That not only reduces the noise, but it also improves the acoustics. Since your sound system speakers are mounted to the doors, soundproofing them will increase the sound quality. Reflective insulation is a dampening material. It’s usually made from aluminized polyester or aluminum foil and laid underneath the carpeting in the cabin. This method is typically used for thermal insulation. However, it’s quite powerful as a soundproofing agent. Reflective Insulation encloses the source of the noise and forms a barrier. It limits the transmission of sound by absorbing and reflecting vibrations from the noise source. For better results, you can combine Reflective Insulation with the previous approach. To avoid the hassle, you can install them both at the same time. Apply reflective insulation directly underneath the soundproof floor mats. Start the installation by removing the carpeting of your car floor. Make sure that the surface you’re applying the reflective insulation to is clean. Then, apply the adhesive and put down previously measured pieces of reflective insulation. Wait until it dries and re-lay the carpeting. This lightweight reflective car insulation (link to Amazon) can cancel out up to 80% of external noise when combined with sound deadening mats. It will also block 98% of the heat coming from the engine’s exhaust system. Spray sound deadening materials (like this Boom Mat Spray) are designed for those hard-to-reach places. They are the perfect solution if you’re left with any gaps after installing Reflective Insulation or Sound Deadening Mats. Areas that aren’t flat or gaps too small for the heavy sound deadening material are easy to fill out with spray sound deadeners. Spray sound deadening materials come in aerosol cans that are easy to use. They also come in professional cans, but those require compressors and paint guns for the application. The surface that you want to apply the spray to must be cleaned and prepped before application. After that, the process is simple and straightforward – use the spray like any other paint. Spray sound deadeners are effective on small surfaces, but we don’t recommend you treat your entire cabin with them. Therefore, it’s best to use them in conjunction with other sound-deadening materials like mats. While sprays effectively dampen the noise, foams are used to absorb vibration. They absorb and disperse the energy that the vibrations make. The foam will effectively absorb the echo in your car cabin, thus improving the acoustics and the sound quality. So, it might be an excellent additional technique to incorporate into your soundproofing project. Another effective way of soundproofing your car is to replace all the rubber seals around your doors and windows. Any gap, even the smallest one, will let sound in your car cabin. Sealing these gaps will have a dramatic effect, especially if there are a lot of them, or if the rubber around your windows and doors looks a little bit worse for wear. Replacing the rubberized seal will mostly affect the wind noise, and cut it down significantly. You can’t do anything about the road and engine noise with this method. Installing new rubber seals on your doors and windows is relatively easy. Just apply the adhesive and place and press the rubberized seal. Make sure to let the adhesive dry down, so you don’t seal your door shut. Road noise and tire noise are very frustrating. Uneven wear on tires can cause them. That’s not only uncomfortable but also unsafe. More often than not, tires don’t wear out evenly. Sometimes one or two tires will have a more shallow tread than others. It’s important to keep an eye on this, as the noise might not be your only problem in situations like this. Worn out tires aren’t safe on the road, as they don’t grip the asphalt properly which may cause you to lose control of the vehicle. It’s normal for the tire tread to become more shallow over time. Sometimes, pebbles can get stuck in the tread and damage it. That kind of irregular tread can cause vibrations and noise. Cheap, low-quality tires, as well as unaligned tires, can have the same effect. Regularly checking your tires and changing them can reduce the road noise. In fact, increasing noise might be a good indicator to watch out for, as it will inform you when’s the right time for a tire checkup and replacement. Rubberized undercoating has a multitude of benefits. It is used to protect the car from outside abrasions and corrosion. It’s effective against sand, water, salt, and chemicals. However, it’s also suitable as a sound dampener. Undercoating can affect and dampen road and engine noise. Rubberized undercoating will muffle the sound caused by vibrations or the engine and tires . It’s simple to apply because it usually comes in spray cans. Therefore, you just need to spray it on any surface you want isolated and wait for it to dry. One of the benefits of soundproofing is the increased acoustics. You’ll hear a much better sound quality if you soundproof your car. However, if you can’t be bothered to do this, you can always fight noise with sound. Or, should we say noise? Well, it depends on what your favorite tunes are. Moving on, you can always increase the sound inside your vehicle to battle the one coming from the outside. Try installing a new sound system if installing sound deadening materials seems like too much of a hassle. Something with a lot of bass power should effectively cancel out the exterior noise. However, keep in mind, this method isn’t something we would recommend. As fun as it may be to blast the music through a powerful sound system until you can no longer hear the engine and wind roar, it’s not exactly safe. While driving relies primarily upon sight, hearing is just as important. So, entirely canceling outside noise might be counterproductive. Some sounds you must hear, like the warning honks of other drivers. If this article hasn’t been convincing enough until now, here are some quick additional arguments for soundproofing. Reducing the noise caused by the engine, road, and wind is crucial not only for pleasure but for protection as well. Noise can avert your attention. And we all know that distractions and driving don’t mix well. While you’re searching for the noise source, or just steaming in your frustration over it, you’re distracted. And, it only takes a fraction of a second for something to go wrong. That’s why your focus should always be 100% directed on driving. No matter what soundproofing method you choose, any noise decreation will have powerful effects. We recommend using a combination of several different methods. For best results, use two or three of them, and install and apply them at the same time. That way, you can finish the job “in one sitting,” as they say, and avoid the hassle. However, even if you choose just one method, it will be noticeable. Cutting down the noise even by only 15-20% will make your ride smoother and more enjoyable. If you think sound deadening mats are the right way to go, check out our Review of 10 Best Automotive Sound Deadening Materials. What do you think? Comment below and let us know what soundproofing techniques you think are best!